We are the Americas' leading airframe MRO providing the best value in the industry based on our world-class performance levels in safety, quality, turn-around time, service and cost. Aeroman is the industry leader in providing airframe heavy maintenance, modification and paint for some of the world's top aircraft owners and operators. With over 35 years of experience, we have consistently provided best-in-class services and solutions enabled through a steadfast commitment to our people and their communities. Aeroman is one of the world’s largest aviation maintenance campuses with capacity to service over 35 aircraft simultaneously inside our six hangars. Aeroman provides a broad range of Airframe Heavy Maintenance, Components and Customized services. We have proudly become one of the industry’s leading MROs by focusing on our customers’ needs and providing exceptional cost-effective maintenance solutions. We have deep expertise for Airbus A320, Boeing B737, and we continue to expand our wide-body and regional jet services. Our commitment is to provide the best maintenance solutions for our customers, always exceeding their expectations. At Aeroman, our dedicated customer teams work at the highest standards, serving as an extension of the airlines’ own maintenance organizations. Based in El Salvador, we have a convenient and desirable location which allows easy access to airlines in the United States, Central and South America. Additionally, we have the benefit of being within El Salvador International Airport, which allows us to offer our customers timely customs processes, among other advantages. Our 6 hangars are capable of accommodating up to 35 production lines for narrow and wide-body aircraft. Our facilities are fully compliant with International Building Codes (IBC) including fire detection and suppression systems and include the following shops: Structures, Composites, Paint, Seats, Heat Treatment, Welding, Machining, Inflatables, Air Conditioning, Avionics and Metrology . For over 35 years, safety has been our number one priority. Aeroman holds a wide number of international certifications including EASA and FAA. To guarantee these safety standards, all employees undergo hours of constant and rigorous training which allow them to develop the technical skills necessary to assure excellence in all services offered. 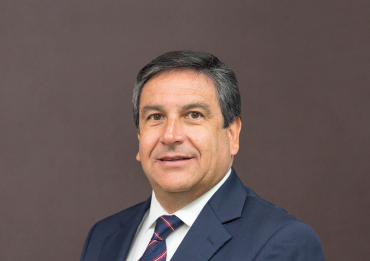 Mr. Echeverria leads one of the biggest MROs in the America’s to provide the highest results in Safety, Quality and Performance. More than 30 years of wide experience, in ENAER, LATAM Airlines and Airman MRO, have allowed him to be deeply involved in all Strategic, Maintenance and Engineering activities in the aviation industry. His leadership and knowledge enables the organization to provide world class services, creating added value and high satisfaction levels to our customers. Our philosophy at Aeroman is simple: to recruit, train and invest in the best people in the industry to align our services and solutions with the long-term needs of our clients. If you have what it takes and are interested in joining our team, please explore our current opportunities.